They bantered about this some more, and as they explored other areas, they weren’t so sure. What about art? Or sports? Clearly some people are just better than others, right? I introduced them to a formula championed by psychological researcher Angela Duckworth: When it comes to achievement, effort counts twice. Why? Because effort develops grit. And grit is a better predictor of success in a whole host of outcomes than grades or talent. Talent isn’t nothing. It’s real, and it’s not doled out equally. Talent (you can put intelligence in this category as well as athletics or artistic ability) in a particular area may determine how quickly someone picks up on a skill or concept. As a culture, we favor talent, or “naturalness.” It’s a hidden bias that causes us to prefer those who achieve successes because of natural ability rather than hard work. Our preoccupation with talent ends up being harmful. Duckworth explains in her book Grit: The Power of Passion and Perseverance, “By shining our spotlight on talent, we risk leaving everything else in the shadows. We inadvertently send the message that these other factors—including grit—don’t matter as much as they really do” (31). A mounting body of research shows that while we bias for natural talent and intelligence, effort counts more. We may not like the fact that hard work and perseverance matter twice as much as natural ability—in part because it lets us, and kids, off the hook if we aren’t “good at” something—but research proves us wrong. Here’s how Duckworth explains it: “Talent is how quickly your skills improve when you invest effort. Achievement is what happens when you take your acquired skills and use them” (42). Effort builds skill, and effort makes skill productive. It counts twice. This is why Duckworth is willing to stack her deck on grit. Grit is commitment and perseverance over time. It’s getting up in the morning and going after a goal again, even after failing the day before. Big difference. The power of yet. The power of grit. One huge key to grit is endurance. As Duckworth notes, “Enthusiasm is common. Endurance is rare” (58). Endurance is steadily working at a skill, sport, art, or ability for a long time. The key is finding something you really care about, which for adolescents, of course, can change like the wind. For high school students, research has shown that participating in an extracurricular activity for at least two consistent years is correlated with higher rates of college graduation, having a job as a young adult, and volunteering in adulthood. It seems that grit developed in a particular pursuit transfers to other life pursuits as well. Of course there are parts of any skill, activity, or job that young people won’t enjoy, but overall, being interested in and curious about something goes a long way toward being willing to stick with it over time. The Search Institute calls these interests “sparks,” and they’re different for every young person. Because school is a requirement more than a love for many kids, helping them find an extracurricular activity that interests them is often an important key. In Duckworth’s family, each person finds one “hard thing” they’re interested in and focuses on it for a season (parents included!) and commits to stick with it. 2. Develop the capacity to practice. In just about every area of life, we become who we are by practicing. Those who become truly great at a particular skill practice a lot, devoting time each day or each week to get better, and resisting complacency by practicing deliberately—getting better at something specific. Interest without a real sense of purpose doesn’t last long; we need to believe that what we’re doing matters—to us and to others. This becomes more important to teenagers as they are trying to reconcile where and how they spend their time with what they truly care about and how they want to contribute to the world around them. In particular for those who feel trapped in classrooms 35 hours out of each week, pursuing lifegiving activities beyond school can energize their purpose. Find more resources for developing grit here. It’s okay if your 16-year-old isn’t showing an obvious lifelong pathway yet. Grit can be practiced and developed in areas we aren’t as naturally drawn to initially. The key is to help teenagers find some area of challenge in their lives that they’re going to devote themselves to for a season. Pick something hard. Set stretch goals to get better and improve specific weaknesses. Learn to get feedback from others who are better at that skill. Get up day after day and do it again. One last thing. Parents who want gritty kids can work on becoming gritty adults ourselves. 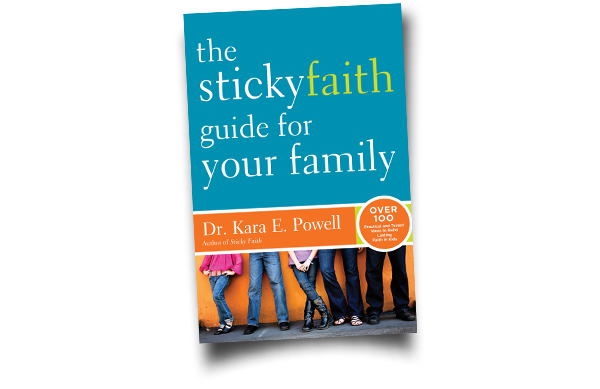 As we discovered in our parenting research for Sticky Faith, loads of research now affirms that what matters more than what we think we are teaching our kids is what our kids perceive us teaching them. Their perception is largely shaped by our actions. The great news is that grit can be developed at any age. After all, despite our preference for natural talent, grit ultimately wins the day. So what’s your next hard thing—the thing that might remind you of the power of “yet”? Find it, and share it with your kids! You might be surprised at how it inspires them.